Debt-Ceiling Danger Zone Threatens U.S.
Take a deep breath: The latest doomsday scenarios for what might happen if Congress fails to raise the debt ceiling later this fall are now out. Sometime between Oct.18 and Nov. 15, the Treasury will exhaust its borrowing authority and begin running short of cash to pay the government’s bills in a timely fashion, according to a new analysis by the Bipartisan Policy Center released Tuesday. Over the next 20 days or so, the Treasury would only have enough cash on hand to cover about two-thirds of government obligations. As it’s done during previous debt-ceiling crises, the Treasury began taking unusual steps and maneuvers to avoid default while buying the administration and Congress additional time to work out a compromise. With no more “extraordinary measures” or budgetary gimmicks left to forestall a first-ever default, Treasury officials would likely have to choose between two alternatives – both of which would risk touching off a financial crisis and a downgrading of the government’s gold-plated credit rating. One scenario would be to pay some bills but not others. That could mean paying out $222 billion in interest on Treasury securities, Medicare and Medicaid expenditures, Social Security checks, education programs, food stamps and defense contracts – while withholding $106 billion of income tax refunds, veterans’ benefits, Department of Health and Human Services grants and operating expenditures for a raft of federal departments and agencies. The other options would be to hold off payments until there is enough cash to cover all obligations due on any given day. That would mean having to postpone payments for days or even weeks on everything except interest on the debt. In a 2012 Office of Inspector General Report, some senior Treasury officials said they believed this second option would be the most plausible and least harmful course of action. Yet it would almost certainly prompt legal action by government creditors and vendors and rattle the global markets. Back in the summer of 2011, Standard & Poor’s downgraded the government’s Triple-A rating after Congress and the Obama administration did not agree on a debt reduction plan and remained deadlocked until the very last minute in forging a budget deal that raised the debt ceiling. So far, those maneuvers have included delaying the reinvestment of assets in the Federal Employees’ Retirement System G-Fund, the Exchange Stabilization Fund and the civil service and postal retirement fund. As of Aug. 31, the Treasury still had about $108 billion of extraordinary measures at its disposal, according to the BPC analysis. The Obama administration has repeatedly warned of economic chaos and a possible government shutdown unless Republican lawmakers agree to raise the debt ceiling again. Once that threshold is crossed, the government could default on payments to major creditors, begin shuttering federal agencies, furloughing workers or miss making Social Security payments to retirees. 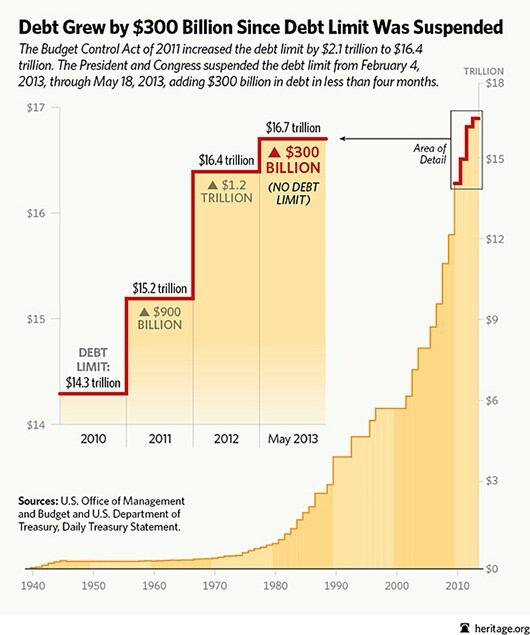 Obama has repeatedly said there will be no political bargaining over the debt ceiling, as there was two years ago. However, the top four Democratic and Republican leaders will meet privately on Thursday to discuss the debt ceiling and how to avoid a government shutdown before Oct 1, according to Politico. The meeting, requested by Senate Majority Leader Harry Reid (D-NV), will be the first time the group has met since they departed Washington for the August recess. It will include House Speaker John Boehner (R-OH), House Minority Leader Nancy Pelosi (D-CA) and Senate Minority Leader Mitch McConnell (R-KY). Boehner said recently he’s gearing up for “a whale of a fight” with Obama over raising the debt ceiling, and that he’ll demand major concessions in terms of spending cuts and entitlement reforms in return for increasing the government’s nearly $16.7 trillion of borrowing authority. It would take an additional $1.1 trillion of borrowing authority to get the government through 2014, according to BPC’s analysis. Treasury Secretary Jacob J. Lew warned Boehner in an August letter that unless Congress raised the debt ceiling, the government would lose the ability to pay all of its bills in mid-October. G. William Hoagland, a senior vice president at BPC, told reporters today his personal preference would be for Congress and the administration to agree on a short-term extension of the debt limit while they thrash out a continuing resolution. The CR would keep the government operating beyond the Oct. 1 start of the new fiscal year.